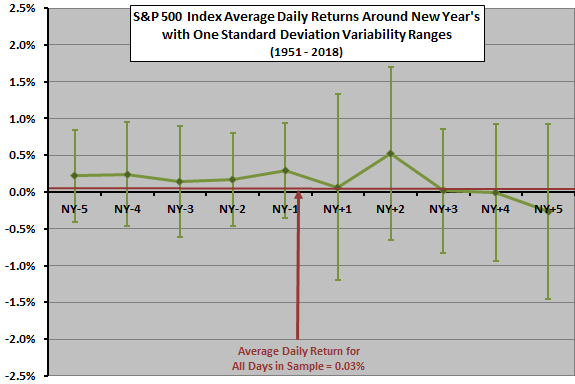 The following chart shows average daily S&P 500 Index returns from five trading days before (NY-5 to NY-1) through five trading days after (NY+1 to NY+5) New Year’s Day over the entire sample period, with one standard deviation variability ranges. The average daily return for all trading days in the sample is 0.03%. Results on average suggest abnormal strength during the week before through two days after New Year’s Day, followed by a fade. As usual for daily data, noise generally dominates signal. To check the reliability of findings, we look at two subsamples. 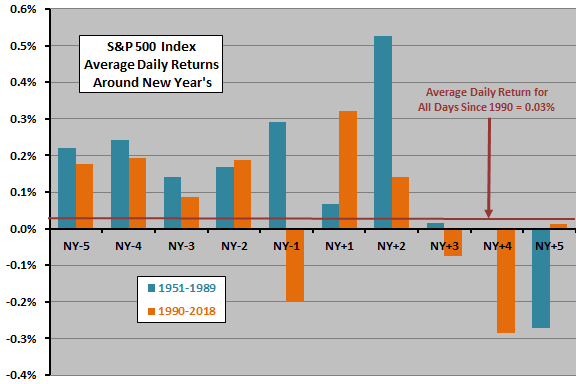 The next chart compares the average daily returns for the five trading days before and after New Year’s Day for two subsamples: 1951-1989 (39 events), and 1990-2018 (29 events). This chart has no variability ranges and uses a finer vertical scale than the preceding one. The subsamples mostly confirm the results found above. In summary, best guess is that any anomalous U.S. stock market strength around New Year’s Day will start the week before and end two trading days after the holiday, followed by a fade, but noise generally dominates. As noted, any return anomaly is small compared to return variability, so experience by year varies widely. To the extent that the distribution of daily S&P 500 Index returns is wild, interpretation of the average return and standard deviation of returns breaks down.